Your basket is still empty! We'll ship latest two days after order. 95% high quality meat without by-products! Do you think about switching your cat(s) of low-quality factory food to high-value and food-grade cat food? Then please allow yourself three minutes to read about the importance of food of higher quality for your cats. Your cats will become more active, will get a shiny and beautiful coat, clear eyes, irritated skin disappears, the dung reduces to a minimum and doesn't smell so bad any longer, the overall condition of the cat will change visible within a short period of time - not to mention the positive long-term effects on the immune system, teeth and viscera - can it be true? 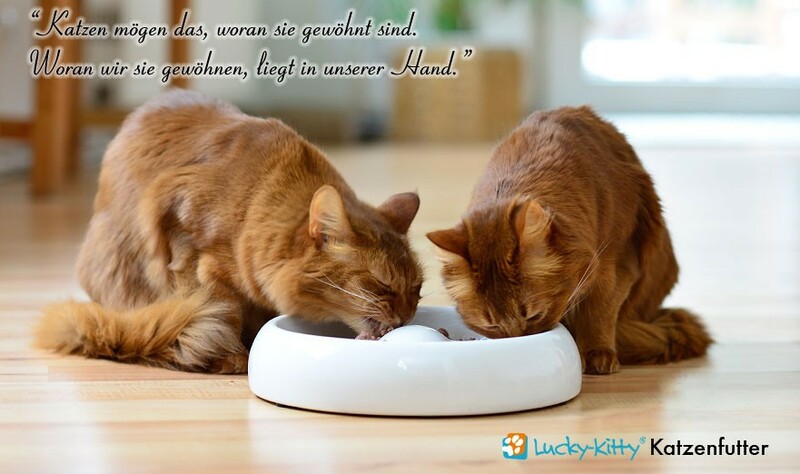 High-quality, healthy cat food of finest food quality with 95% meat rate - exclusively available with Lucky-Kitty. The fresh meat derives from local animals. There are no additives or animal by-products, no sugar (also not hidden in form of malt, beet chips or "only for colouring"), no cereals, without artificial colours and preservatives, no gluten, no binder, no artificial vitamins and no other hidden ingredients which do not have to be declared. Only the taurine essential for cats is added with 1,000 mg/kg as well as a "natural calcium source" for healthy bones and teeth naturally provided by ground egg shells, both recommended by leading experts of animal food. The shells are delivered from a farm in “Nordkirchen” with free-range chickens - (they really run wild outside on the lawn!) They are heated in the oven for being sterilized and then the egg shells are ground. The most important detail: the food is also free of animal by-products - such as the slaughter offal which is always included in factory food and could sicken the animals, and only contains real meat of very high-quality, e.g. heart and fresh liver in food quality - means, as good that humans could eat it too. You can read all about the most important difference between Lucky-Kitty premium cat food and commercial factory food in a detailed summary once again here. in total 3.6 kg finest cat food. Which ingredients are included in the food? Regarding nutritional perspective, the most important nutrients and ingredients are proteins of very high-quality and high-quality amino acids such as arginine, methionine, cysteine, lysine and the very essential high-quality fat as a source of energy for cats, as well as many minerals and healthy vitamins in a natural perfect proportion. The sort "fish" contains the major unsaturated fatty acids, omega 3 fatty acids and tyrosine and iodine in addition to the ultra-high-quality protein. Heart is one of the most valuable entrails. It mainly consists of dark meat and contains natural taurine, essential amino acids, vitamins (B1, B3, B5, B6, B11, B12, E) and minerals. For the type turkey also turkey maws are included. It contains the vitamins A, B1, B2 and B12, C, and D, important for cats, above all the important minerals such as sodium, potassium, magnesium and iron. Carrot, courgette and cucumber are a good source of dietary fibres and consist of supplementary important herbal ingredients such as carotene (mainly alpha-and beta-carotene, "provitamin A"); cucumbers contain peptidases - sort of protease enzymes which dissociate proteins. Meat can be digested much easier by these enzymes. Each tin contains only 3 g of the above mentioned substances in order to approximate to the "maw" of a mouse. Three grams represent about a quarter of a small slice of cucumber. A concentration of 1,000 mg/kg of taurine, an amino sulphone acid, is added to the food, as the cats themselves can only synthesize it to a lesser extent, but the bile salts can only be formed with taurine. Furthermore taurine strengthens the myocardium and is really important for the regulation of the intraocular pressure. As our quality meat also contains natural taurine because of its gentle simmer, we do not add such a high concentration as the producers of factory food. Egg shells are the most natural source of calcium! The trace element "calcium" is essential for the structure of healthy bones and teeth but calcium ions are also important for the nerves and other cells. We attain the perfect ratio of 1.15:1 to phosphorus for cat food by controlling the added calcium. As in general no blood is contained in fresh meat like we use it, but which provides the cats with salts in the nature, we supplement our food with sea salt. Salts are very important for the water balance, the nervous system, the digestive process and bone structure. We use sea salt because it is almost identical to the salt in the blood of small mammals and it contains necessary minerals like potassium, calcium and magnesium, as well as elements such as sulphur, bromine and iron and essential trace elements like iodine, zinc, manganese and selenium in a natural perfect proportion. Which substances are not included in the food? free of "whatever does not have to be declared according to law"
We guarantee the feed does not contain any substances we would not eat ourselves; always at least 95 % meat-rate! We have tried to come very close to the natural cat food. The meat is filled in tins really fresh and the vegetables slightly braised - afterwards the tins are gently simmered in steam according to the latest process of production, for the nutrients and vitamins are conserved almost completely and still healthy. We have tried to produce maybe the best cat food on the market without any compromise. It is the same concerning the addition of artificial vitamins and amino acids - these are dispensable for cats fed with such a high-quality food as the Lucky-Kitty cat food. The used high-quality sorts of meat already contain all important vitamins, minerals, proteins and amino acids which Mother Nature intended to be the best food for small mammals since millions of years. If you feed these three sorts of meat (fish, poultry, beef), cats of all ages get exactly the nutrients they need for a healthy and active life. Unfortunately quality has its price - which often will be only half upon closer inspection. Of course, food of this high quality has its price, because the used high-quality meat in food quality is expensive and unfortunately, we also know not everyone could afford it. However, please consider that cats are able to digest almost the complete food. Often the cat can really digest a small part of the ingredients regarding factory food, the rest - the inferior fillers - will be excreted again. As you can see in our feeding recommendation your cat needs much smaller quantities of the Lucky-Kitty food (up to half in comparison to inferior factory food) for a balanced and full feeding - this reduces considerably the price in relation to the commercial factory food, as you have to buy much less tins - not to mention at all the "saved" veterinary expenses in the future, if necessary. This high quality can be produced in small quantities only, so that the Lucky-Kitty cat food is not available in regular stores, but can only be ordered exclusively via our website here. Please also consider our "tips for food change with cats" which you can download at the end of the page, because a food change should always be done slowly and softly. Especially cats can be particularly sensitive because of their inherited "Neophobie" (fear of new things), if you give them up to now unknown food. How to succeed in getting used your cat to a new food, we have explained on an extra page here. But even if your cat will immediately love the new food, you should proceed slowly. The digestive system has softly to get used to the high-quality food, for it contains much more nutrients now. If you follow our tips a change is easily possible within 2-3 weeks. Approximately 4% of the body weight, i.e. on the basis of the high food quality and the high quality of the ingredients used a 200 g tin is sufficient per day for the energy supply of a 5 kg cat. The feeding should be rationed to two portions per day at least, three or four would be better, concerning kittens definitely more often in smaller portions. Cats in the wild eat up to 30 small mammals or birds during the whole day. Please do not feed directly out of the refrigerator, but take the food from it before feeding, so it gets room temperature. Keep the opened tins refrigerated and consume them within two days. The food is suitable as a complete cat feed. 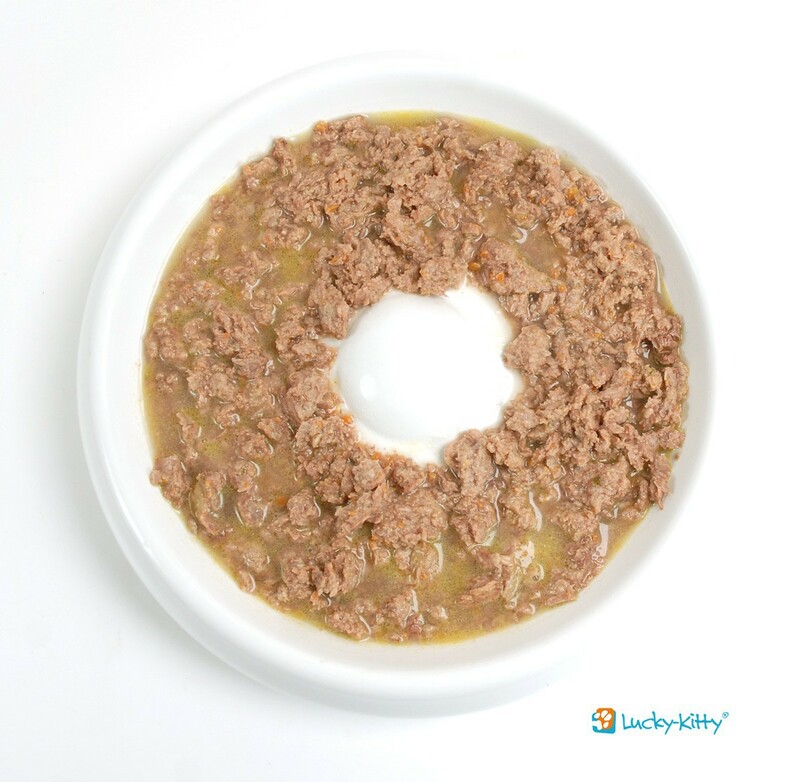 Please note: Lucky-Kitty cat food is all-natural, each single sort Lucky-Kitty tinned food (beef, turkey, fish) has its own natural, high content of vitamins and minerals for this reason. 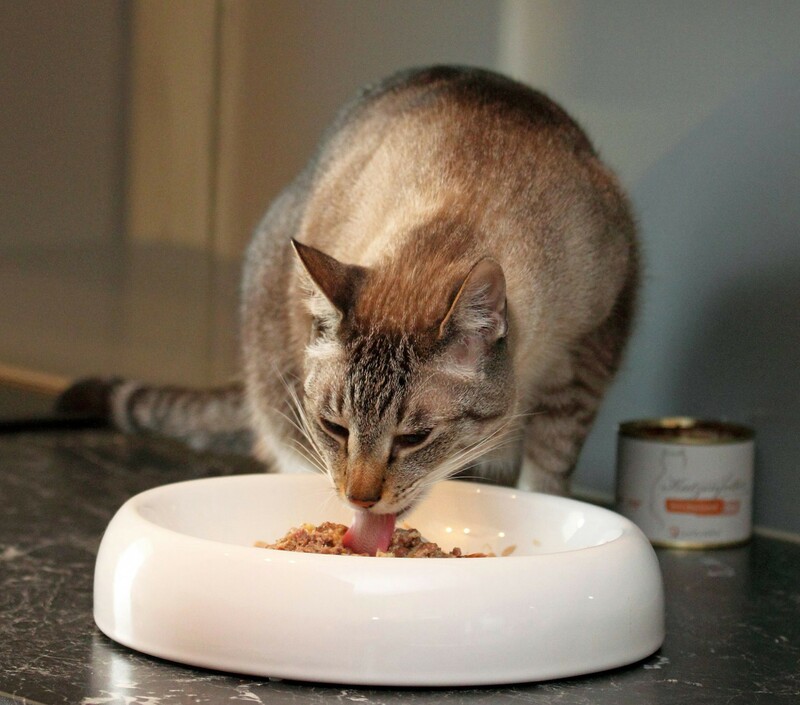 Therefore we propose a feeding like in nature on the basis of the variety of the many natural foods (red meat, poultry, fish): this variety ensures a balanced food for your cat as a result of the different nutrient contents. As fresh meat does not contain any blood, it is important that your cats get enough water additionally. We recommend to add a few tablespoons of water to the tinned food and, if necessary, to set up a cat fountain, so that your cats are adequately supplied with water. Furthermore we recommend a feeding following the B.A.R.F. method (bones and Raw Food). In reptile shops you may also be able to get deep-frozen or refrigerated rats, mice and chicks - of course, this is the best you can feed your cat - perhaps you will be thinking about feeding one of these typical prey animals once a week at least. The Lucky-Kitty tinned food for cats is of very high quality and therefore particularly suitable for kittens, for senior cats, for cats with allergies and even for cats with kidney disease (* in case of "CNI" in the so-called "IRIS" phase I to II and please always in consultation with your veterinary; in case of "CNI" in phase III and IV you should add some phosphate binder to the high-quality food depending on the measured blood values of your cat. ), because the quality of the included proteins is as high as possible and the phosphate content is comparatively low - this relieves liver, stomach, intestine and especially the kidneys. Here is another important note about "CNI". For animals with "CNI" the sufficient liquid intake is particularly important. The disability of the kidney to concentrate urine is known to result in polyuria. If this fluid loss is not compensated by the drinking water intake, the risk of dehydration could be imminent, a state which could be quickly life-threatening. Therefore cats with "CNI" should always have a cat drinking fountain at their disposal. Naturally this also applies to older cats - they do not need factory "senior food" but food with a very high-quality protein - or do you have ever seen special mice for cats over 8 years in the nature? for reasons relating to trademark law, we can't sell the Lucky-Kitty Catfoot to customers living in Belgium, Netherlands and Luxemburg. Orders from this countries will be cancelled in any case! Thank you for your understanding. Der statistisch berechnete Phosphorgehalt beträgt ca.0,12%. Meine Katzen sind sehr zufrieden mit dem Fressen. Schmeckt den Katzen ausgezeichnet. Konsistenz ist fest, Inhalt sieht sehr wertig aus. Geruch ist top. Jederzeit wieder. Your personal data is protected. Copyright by Fountana GmbH & Co. KG. "Lucky-Kitty" Trademark, and the "Lucky-Kitty Logo" are protected trademarks.